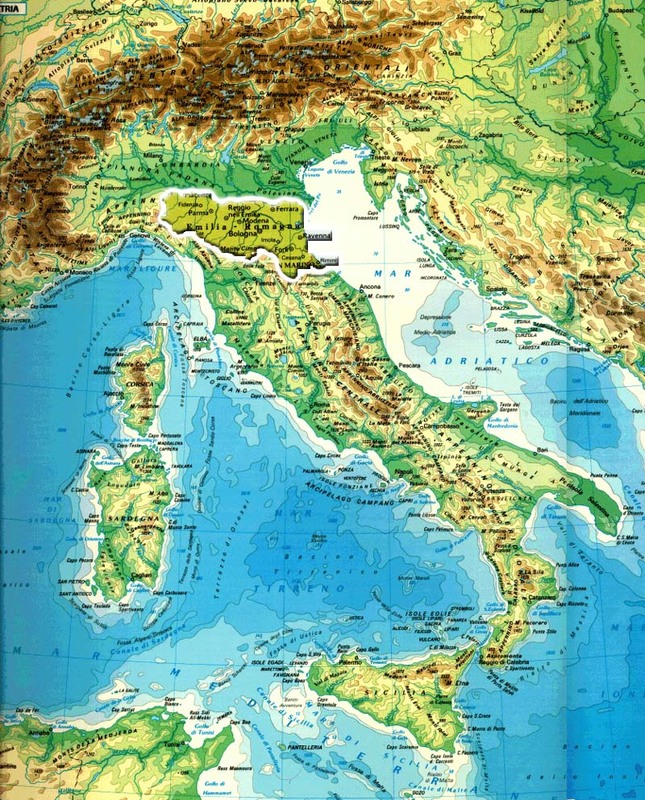 Each of the seven lidos has its own special reality and spirit, so it ensues that holidays in Lido di Volano, Lido delle Nazioni, Lido di Pomposa, Lido degli Scacchi, or in Porto Garibaldi, in Lido degli Estensi and in Lido di Spina, are completely different one from the other. The Seven Lidos are located along the 25 kilometers of the Ferrara Province which is characterized by vast sandy beaches and numerous pine forests. Modern bathing resorts grew up here starting from the 1960's and are today a well-established international tourist attraction. With their dozens of hotels and campsites and thousands of houses and apartments for rent, the "seven Lidos" represent one of the most popular areas of the Adriatic coast, lying just adjacent to the Po Delta Park, one of the largest natural reserve in Italy. Each resort has its own particular features distinguishing it from the others and completes the range of attractions offered by the coastal area. 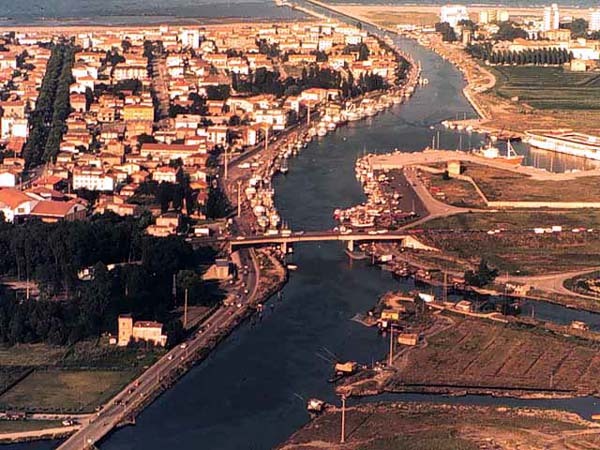 Lido di Volano is the northern most of the coastal resorts, situated 20 kilomtres northwards from the town of Comacchio and is considered part of the Po Delta Park as it is surrounded by the peaceful pine wood of Volano. Once it was a small fishing village, nowadays it is a modern seaside resort immersed in the green. Nature and sea seems to be the very characteristic of this place where you can have sunbathe on the sandy beach and ride on horseback or by bike in the magnificent scenary of the Po Delta Park. Among the seven Lidos of Comacchio, the Lido delle Nazioni has the most rational urban plan, which leaves wide space to the greenery and to the sport centres and grounds. This resort is equipped for many modern sports, particularly around the vaste basin of Lago delle Nazioni, an artificial lake where you can practice canoeing, sailing, waterskiing. There are also two riding schools featuring the magnificent horses of the Camargue-Delta breed, which live in this area along with the rich fauna of the Po Delta Park. All around the Lido is possible to immerse in the nature, follwing path and itineraries through the Volano Pine Wood or along the Valli Bertuzzi, a wide water oasis. Lido di Pomposa is situated near Lido degli Scacchi and they have one thing in common: they are both ideal beaches for families. For the children's entertainment there are plenty of gamerooms, playgrounds and merry-go-rounds. The 3 kilometres long beach has numerous modern equipped sea bathing centres and a well kept seafront promenade perfect for strolling. Along with the hotels and apartments there are several touristic villages which every year welcome a very large number of foreign tourist. 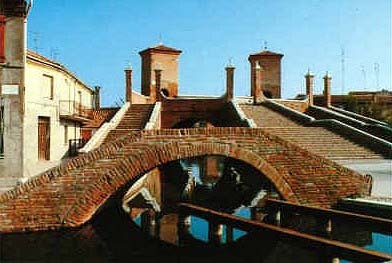 Seven kilometres from the town of Comacchio, you can find Lido degli Scacchi, a comfortable and peaceful sea resort. The numerous residences, villas, apartments and campsites, the large and safe sandy beach and the entertainment for children make this Lido ideal for families. The port preserves on the seafront the aspect of the ancient fishing village. It is the kingdom of gastronomy and fishing. Its numerous restaurants strech along the beach and the wharves. It is undoubtely the most pictoresque of the Lidos. 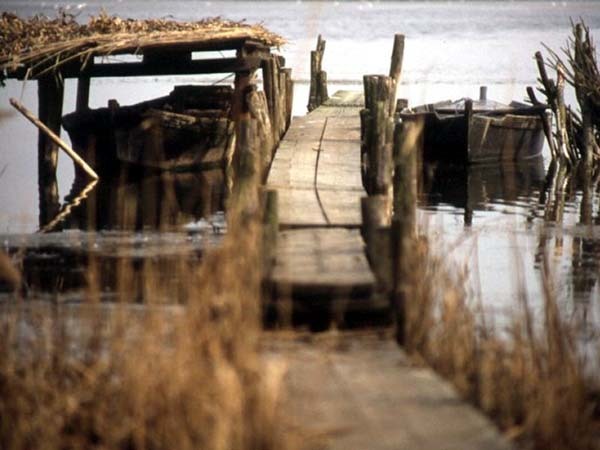 From here several motorboats leave on excursions into the Po Delta for inland mackerel fishing. And on the wharf, the evening stroll is a tradition for hundreds of tourists. 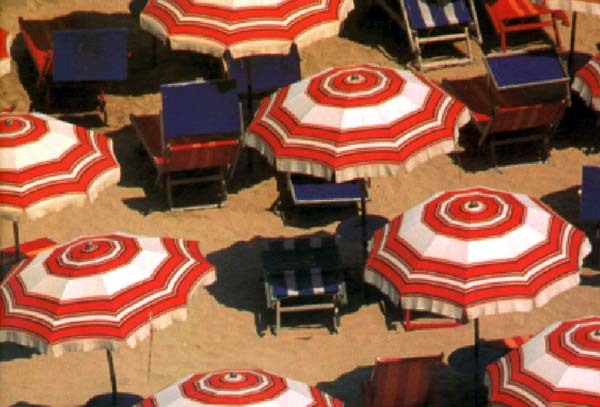 Lido degli Estensi is without any doubt the most lively and wordly resort of the Lidos. It is also the seat of the splendid Marina degli Estensi, a very up-to-date touristic port which can handle over 300 boats and is equipped with modern and comfortable services for boating. The Lido offers a lot of facilities. The main street, Viale Carducci, is the most fashionable shopping centre along the coast. A full kilometre of night clubs, pubs and shops, close to the beach, wher you can find a vaste range of products, from the tipycal handicraft to clothes by the most famous names of fashion. The Lido has also immense beaches of fine sand which are among the longest on the Adriatic coast and where you can find many sea bathing centres that offer a lot of facilities: fitness, sport grounds, entertainment, games. Lido di Spina is the soutthernmost seaside resort of the province. It streches down the coast for more than 6 kilometres immersed in a beautiful pine wood between the sea and an internal lagoon. Wide streets, elegant villas and beautiful gardens charcterize this Lido. Here there are also comfortable hotels, sport grounds (particularly tennis courts) and other facilities that assure a pleasant and relaxing holiday. In Lido di Spina is situated the futuristic house of the painter Remo Brindisi who was fond of spending time on this beach and left after his death his collection of modern and contemporary art to the local community. His house is now seat of the Alternative Museum named after him where important works of the main 20th century artists are on display.